Sri Venkateswara Mahatyam is a 1960 Telugu Musical film produced and directed by P. Pullaiah and starring N. T. Rama Rao. The story is based on the story of Lord Venkateswara .Sri Venkateswara Mahatyam titled as Balaji was first made in 1936 by P. Pullaiah under the Famous Films banner. 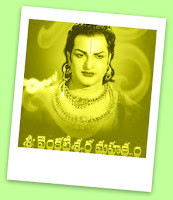 It was C. S. R. Anjaneyulu acted as Balaji and Santha Kumari as Padmavathi in the lead roles. The movie was said to be among the successes of the early days of Pullaiah and Shanthakumari's married life.